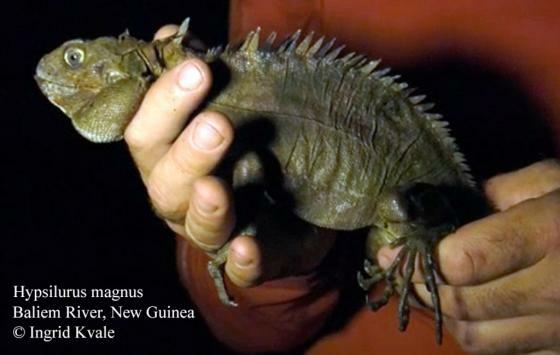 Can you confirm these amateur observations of Hypsilurus magnus? Diagnosis Diagnosis. Large, long–tailed species (SVL males up to 232, females up to 184 mm [Urban, 1977 as nigrigularis]; TL/SL > 2.8) with homogeneous dorsal scalation and a discontinu¬ous vertebral crest. Scales below the tympanum weakly enlarged, at the angle of the mouth some¬times several more enlarged scales; a row of enlarged submaxillaries present; anterior edge of the gular pouch without enlarged scales. 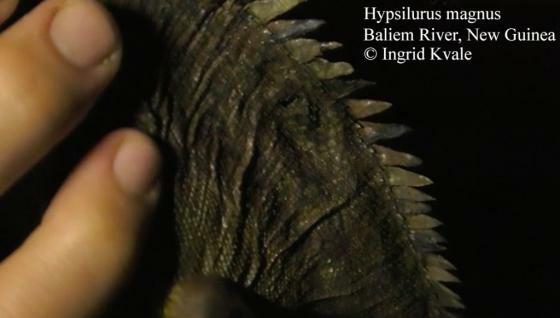 Hypsilurus magnus differs from H. bruijnii by a higher number of scales between enlarged submaxillaries and infralabials 4 (vs. 3) as well as a SVL up to 232 mm (vs. 143 mm) and dif¬fering colouration in alcohol (greenish grey without or with darker dorsal bands, each en¬closing a light band vs. reddish brown without clear bands); H. modestus by the presence of a dorsal crest (vs. absent); H. auritus, geelvin¬kianus und nigrigularis by the presence of a row of enlarged submaxillaries, a small gular pouch with rounded base near the clavicular region (vs. large with acute base on the chest) as well as a differing gular pouch scalation, anterior half with large scale, posterior with small scales (vs. complete gular pouch with equally sized scales); godeffroyi and schoedei by a higher number of scales between enlarged submaxillaries and infralabials 4 (vs. 3) and a smaller tympanum T/E < 0.76 (vs. > 0.80), additionally from godeffroyi by narrowly spaced and overlapping anterior scales on the gular pouch (vs. widely spaced), a shorter tail TL/SVL < 3.1 (vs. > 3.3), as well as a broader head HW/SVL > 0.145 (vs. < 0.128) and from schoe¬dei by a significantly larger SVL up to 232 mm (vs. < 130); longii by smooth anterior scales on the gular pouch (vs. keeled) and in females as well as younger males an absent V–shaped marking on the nape (vs. present); macrolepis by a shorter tail, TL/SVL < 3.1 (vs. > 3.5), a smaller tympanum T/E < 0.76 (vs. > 0.80) and a significantly larger SVL, up to 232 mm (vs. < 130); binotatus by a discontinuous vertebral crest on the nape (vs. continuous); papuensis by the absence of dark spots on either side of the neck surrounded by a lighter colour above and behind (vs. present); schultzewestrumi by the absence of extremely large plates on the sides of the head (vs. present) and by smaller gular scales ≈ Ø tympanum (vs. several ≥ Ø tympanum) and boydii, spinipes and dilophus by a homogeneous dorsal scalation (vs. heterogeneous) and a longer tail TL/SVL > 3.2 (vs. < 2.3). Comment Similar species: H. bruijnii. Etymology Named after its large size.